There is a reason why users aren’t subscribing to your notifications as they should. Here is a question you need to answer - What is the ‘right time’ to push out a web push notification? Here is a hint - it is definitely not forcing the users to act on a prompt as soon as your website loads. Read on to know what permission UX is and how you can delight your customers. Sometimes it so happens, that users tend to close the permission prompt un-knowingly or aren't keen on receiving notifications from you at that moment. Which makes sense, why would a user who is visiting your website for the first time opt for notifications? They do not know what your website is all about or what value they can get from it. Once they get to know what is in store for them, there is a chance that the users will opt for your web push notification. 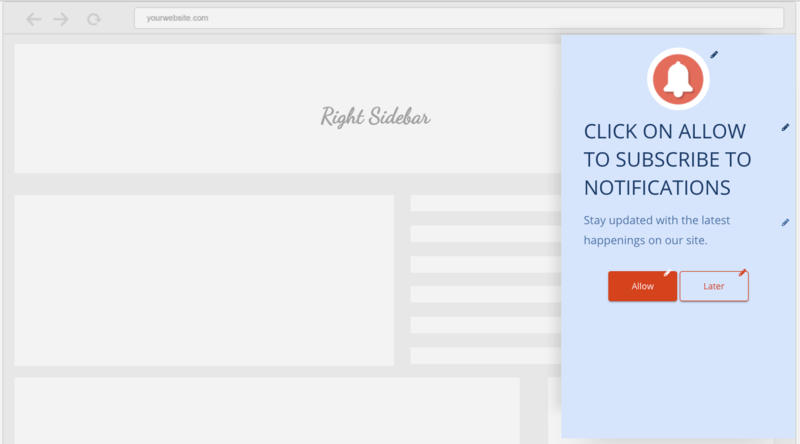 Prompt users to subscribe when they have spent some time on your website or on a user action. This ensures that the subscription process is relevant, smoother, and makes sure that it doesn't hamper with the UX. With the latest Chrome update, notification subscription prompts are blocked for a week after the third dismissal. By August almost all of the users would have updated to Chrome 59, which also means that they won’t be receiving subscription prompts if they choose to dismiss it for 3 times in a row. One more reason for you to place user experience on a higher pedestal. You can show users a website based permission prompt which your website has control over. If a user wants to receive notifications from you, you can go ahead and ask users to click on ‘Allow’ on the browser based permission prompt to confirm their consent. The main reason behind implementing a two click process to mold the prompts in a way that will be appealing to the users. You can set the context , design it in a way that would please your users and make use of the right words to attract the users in one go. It also saves you from being blocked even if a uses dismisses it more than 3 times. 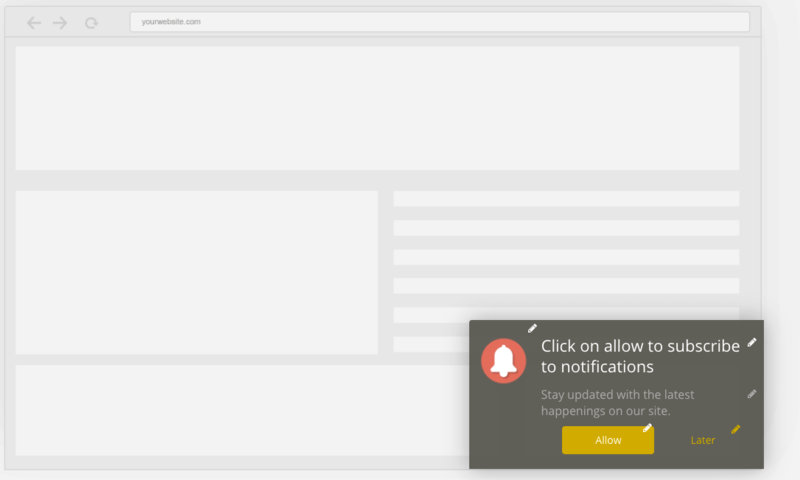 On your iZooto dashboard, click on ‘Settings’ and select ‘Modify Subscription Prompt’, where you can choose your desired notification template and edit it. You can customize the logo, title, description and the 2 CTA buttons. Once you are done you can click on ‘Save & Activate’. You can fix a time when the prompt should be shown on the user's screen. 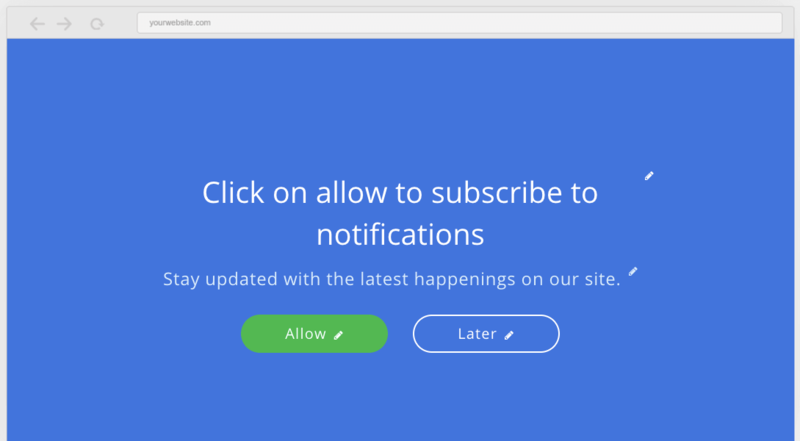 It is recommended that the prompt should be displayed after a user spends some time on your site to increase the chances of users subscribing to your notifications. Don't annoy the user with constant prompts just because they visited another page on your website. Set a time frame and send notifications accordingly. You can also trigger subscription prompt button onclick events. Start engaging users from day zero. 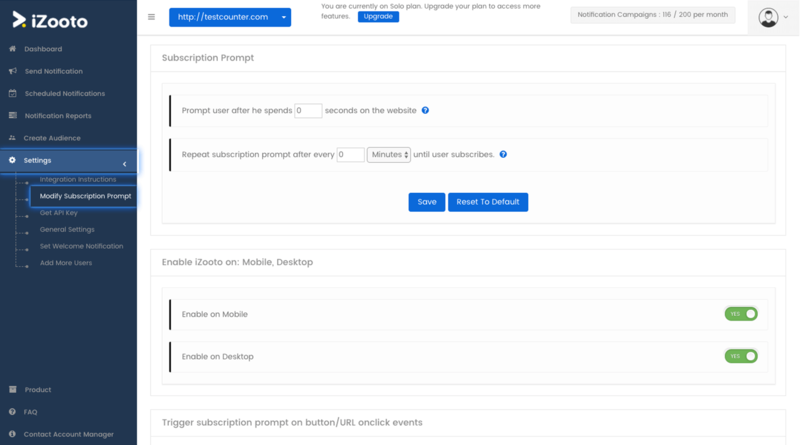 Try web push notifications for free!